Welcome to Monster Bike Events. Come to one of our events and we’ll show you a roaring good time on two wheels (or three in the case of our 7-seater Monster Bike). We’re all about bringing cycling fun to the community. We run workshops, entertain with our cycling activities and design bespoke events for groups of all ages. It’s always a day of stomping good fun and practical demonstrations with a big monster twist. 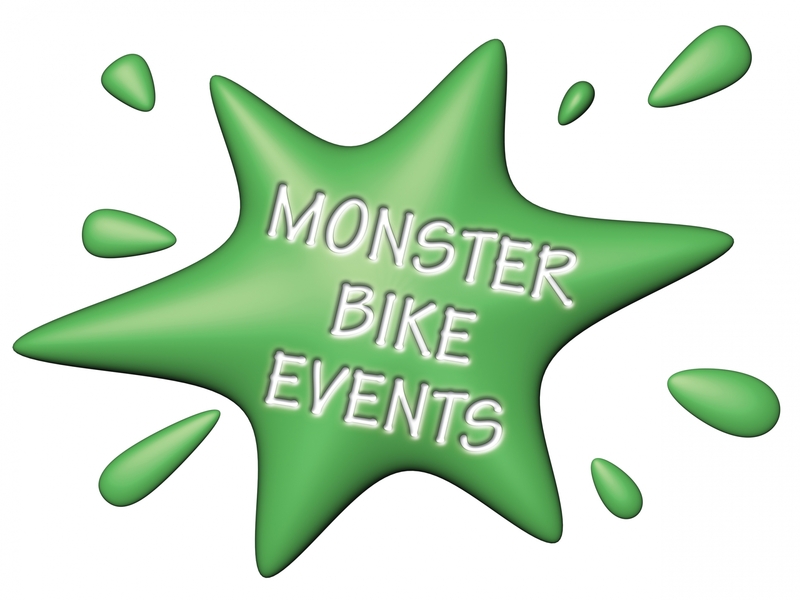 Catch Monster Bike Events at our next show or you can book us for your school, workplace or community. We’re small, locally-based and flexible so we can create the perfect cycling event for you – just get in touch. We have the beast of all bikes. The legend, the wonder, the colossus that is… the monster bike. With seven seats, ten pedals, three wheels and a central steering wheel, it must be seen to be believed. You won’t want to miss seeing this in action. Bike lab started life as a decontamination unit. We bought and modified this large box trailer as the monster-sized space is perfect for a workshop for people to wheel in their bikes for check-ups and maintenance. A few fitted lights, power sockets and workbenches later, the Monster Bike Events Bike Lab was born. Plastered in eye-catching graphics, it’s hard to miss! Our Cycle Circus is a chance for you to be let loose on some of the weirdest and most wonderful bikes around. Whatever your level of experience, you’ll soon be having fun trying out these quirky cycles. You can do the limbo on our clown cycles, challenge yourself with our roller races, have a go at a unicycle obstacle course and get to grips with our strangest model yet, the spooky cyco cycle! Rollers. You climb on. You pedal as hard as you can for 20 seconds. But don't try too hard! The Monster Bike has an unusual effect on it's riders, it's not really scarey, but people do scream! Bike Lab School has been officially launched by Olympic Cycling Gold Medallist Jamie Staff. Jamie visited Bike Lab School on it's inaugeral outing at Goldwyn Community School. The Bike Lab had another busy day at the University of Kent. Back soon!